...that there are way too many different tools for SH3 to handle out there? S3F uses all you need! ...that the copying and configuration of multiple installations is not intuitive enough? S3F does just that for you! ...that patching and configuring mods in multiple locations is "too hard, too heavy", too? ...that "H.sieing" takes too much handwork? S3F now includes "automated H.sie"! ...that installing "Stiebler" takes too much handwork? ...that you would eventually like to have a "all-in-one-box-lovely-solution"?
" S3F " is an addon for our beloved subsim #1. It is available FREELY for everyone and free of charge. Here on the first page of this very thread you will find everything you need. I sincerely hope my tool will enhance game fun and reduce installation woes for you folks! If you want to contribute or give us feedback prior to first release, please . If you want to contribute or give us feedback after first release, you can simply reply to this thread. Please notice that BL!TZKR!EG only reacts and/or replies if you meet the demands listed here. Last edited by BL!TZKR!EG; 02-22-2017 at 02:45 AM. █ has been tested working on Windows XP, Vista, 7, 8/8.1, and 10. With this ONE found version for every tool listed here, S3F is able to run any other SH3-installation. Not more than only ONE version each is necessary and S3F provides code for that. S3F only uses MD5Sum-validated versions, i.e. unchanged and current versions as listed above. Outdated versions of the tools listed above are ignored. This especially applies for users of the good, but old GWX 3.0 Gold: This mega-mod has an outdated JSGME included. So if you want S3F to recognize JSGME, update to the latest version of JSGME and do not ask this over and over again - it is LOGIC! Last edited by BL!TZKR!EG; 02-08-2017 at 05:31 PM. Download the latest archive (Current download-links are always provided in post#1 of this thread!). Unpack to ANYWHERE you want. Desktop is fine! Simply overwrite an earlier version. I recommend to use 7-Zip. Allow it through your security-software (Defender? Avast? Norton?). Let S3F scan your system. That takes time. Do NOT click anything. Simply let it run! S3F will then display a list of all found SH3-installations and SH3-tools that you can use. Select one of your installed SH3-installations. Click on one of the program-icons below to run THAT program with THAT SH3-installation. Ah yes and as for the question "Why no installer?" - I share the opinion of Oleh Yuschuk, the programmer of Ollydbg: "No installation means also no trash in registry and system directories." Last edited by BL!TZKR!EG; 04-26-2017 at 12:17 AM. This function executes the routines that check the version and display further file-information of the previously selected installation of SH3 and allow you to enable/disable the 4GB-Patch. Important to notice is that it is nonsense to 4GB-Patch an existing SH3.exe on a NON-64bit-Windows-System. All information given in this direction, be it even from your favorite modder, is WRONG. Read on ntcore's page why - because he was the one who had this idea. This is why this option is activated only when S3F is run on a 64bit-system. IMPORTANT is that you deactivate your Anti-Virus-Software for the moment this patch is run. Otherwise you will run into problems, learn more here. 2. S3H, the fully automated H.sie-Patch - new: in "Patch&Fix"
in short: the complete H.sie-Patch! A H.sie-patch correctly installed the old way can easily be removed by just deactivating the mod-part that the old H.sie-patch adds to the MODs directory of your installation. Another difference between the old and the new way is that the old way misinterpreted an sh3.exe that already HAD been patched to 4GT, so that the old H.sie-patch was not applicable in that situation. S3F however (and I use H.sie's original detection-method) blanks that patch and therefore recognizes all SH3-versions correctly. IMPORTANT is that you deactivate your Anti-Virus-Software for the moment this patch is run. Otherwise you will run into problems, learn more here. AGAIN: Make sure your free or cheap AntiVirus-Software is set to OFF or IGNORE (AVAST! AVG! All that!). Patches are changes to the actual code of an .exe or .dll, so these AntiVirus-Kits will be irritated. There is no way around that. 3. JSGME - Jonesoft's Generic Mod Enabler - new: in "MODS"
If found as previously installed on your system and validated as correct version, you can click on this icon to view, change, load, save the mod-setup for the previously selected big-mod. If previously installed and validated as correct version, you can start S3C for the previously selected big-mod here. If that big-mod is either GWX, LSH or NYGM, this will be recognized and the supplemental files will be injected. This is self-explanatory as in fact most of the project. Here you simply start the installation that you have just selected. 6. ME1 - MissionEditor - new: in "Missions"
This starts the standard MissionEditor - if found and verified. 7. ME2 - MissionEditorX2 - new: in "Missions"
This starts the standard MissionEditorX2 - if found and verified. 8. SK - SetKeys - new: in "Settings"
If you have SetKeys installed and your installation is valid, then you can select any installation of the list and run SetKeys for that installation. S3F automatically detects your language and starts SetKeys with the corresponding language-file of that installation. 9. S3M - Silent Hunter III MultiSH3Copy - new: in "Settings"
right (en/de depending of what S3F detects as your language). Last edited by BL!TZKR!EG; 02-08-2017 at 05:32 PM. 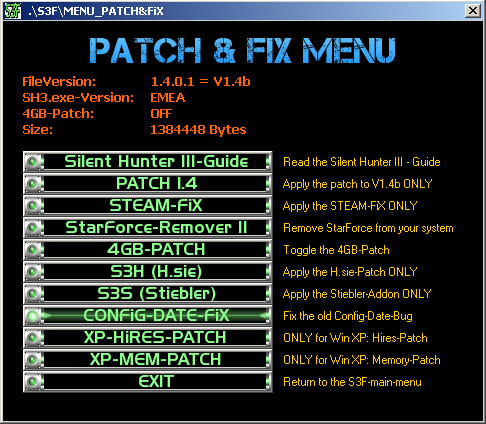 1) complete a fresh install of SH3 patched up to V1.4b. 2) create a copy of the program folder & rename as required. 3) use MultiSH3 to create separate save locations for each install. 1) The whole selected installation will be copied to where you want (stay out of Programs\X86 though). If the selected installation contains MODS these are as well included in the copy, no matter if they are active or deactivated. You make a 100% copy of that selected installation, no matter how "tuned" it is. In this example stock 1.4b would be the basis for everything and the mods on top of it. Use S3F to make the copies and have them activated (that used to be a MultiSH3-function as explained above). In this case GWX is also the basis for GWM (which is a "tuned" version of GWX). Let me give you an example that I was asked for by the D.E.F. Download it from the S3F-Project-Page(this page). Unpack it. I recommend to use 7-Zip. Execute it as administrator. Instructions here in the S3F-Thread page#1 post#4. Let it do a full scan of your system. That creates a data-file for later use. Make sure you have a clean SH3 stock 1.4b installation. If you have already have GWX 3.0 running or do not wish to play stock 1.4b then proceed to step 4. Make a .zip-archive of this clean SH3 stock 1.4b installation and save it on a USB-stick or burn it to DVD. A clean SH3 stock 1.4b installation is the basis for EVERY big-mod that is out there. You will need it. Promised. Make sure you have a clean installation of GWX 3.0 with no further mods activated. Instructions here in the S3F-Thread post#4. Select the S3M-function on the far right-hand-side and make yourself a copy of the clean GWX 3.0-installation. Call the new path for example "d:\Games\SH3-GWM". When asked for a 3digit-combination enter GWM here. Unzip it to the new installation that you have just created in step 2, that is maybe "d:\Games\SH3-GWM\MODS". Either you manually create that subfolder "MODS" or it will be created if you unzip to that directory, i.e. a path consisting of the path to your clean GWX 3.0-installation plus "\mods" added to the end. Select that newly created installation. Activate the mod "GWM - Multiplayer Optimised..." now. This will update GWX to GWM in that very directory. This will leave all other installations untouched. You are now ready to play either GWX for your single-campaign or GWM for Tunngle-Multiplayer-sessions. Simply run S3F and select from the menu that is presented. Is that cool and easy or what! Last edited by BL!TZKR!EG; 08-24-2015 at 04:34 AM. It was recommended to have a separate install of S3C for each different install of SH3. 1) Install S3C and rename the program folder to suit. 2) Rename each S3C-shortcut as required. 3) You will need to use the l: switch to point S3C to the right installation. You only need to have S3C installed ONCE and by using it together with S3F you can apply it to ALL installations. Simply execute it with the previously selected installation. The appropriate supplement-files for the well-known big-mods "GWX", "NYGM" and "LSH" (5.1 only!) will be injected automatically (This injection is about to come in the next release-version and is only accessible to beta-testers in V1.6.9.92b). Last edited by BL!TZKR!EG; 12-23-2015 at 06:28 PM. 20140410 [RELEASE] TRAiLER for V1.2.5.0b - Announcement for 10 days countdown to first release "EDiTi0N SUBSiM"
20140916 [RELEASE] TRAiLER for V1.6.9.91b - Announcement for upcoming release "EDiTi0N DOENITZ"
20150224 ALPHA-test-version 2 given to testers - Testing is an issue due to a lack of qualified testers. 20150522 [RELEASE] TRAiLER for V1.8.7.6b - Announcement for upcoming release "EDiTi0N RAEDER"
Last edited by BL!TZKR!EG; 02-22-2017 at 02:44 AM. + the whole code for Stiebler's ingenious Addon V4C will be included and NO manual work is anylonger needed. + verifying that that S3C HAS done auto-rollback - how? Last edited by BL!TZKR!EG; 01-05-2016 at 04:08 AM. S3F scans ALL harddrive-partitions for "SH3"-related files. S3F stores what it has found in its own S3F.ini-file. - functions to make a copy and activate it. - 20140131 - COMPLETED - Procedure to search for files. - 20140204 - NEW - SH3-Front-End-BG.jpg. - 20140207 - COMPLETED - Buttons for main-menu. - 20140212 - NEW - Menu-routine in the tests. - 20140216 - CHANGED - Extensions to main-concept. - 20140225 - NEW - SH3-Front-End.ico. - 20140303 - NEW - Basis of the code. Test-Environment I. - 20140304 - COMPLETED - Button-Menu. - 20140305 - COMPLETED - Multi-Recursive-Search. .backup will be filtered now. MODS will be ignored now. The number of found installations is stored. - 20140307 - NEW - Div. variables and the idea of having a dynamic "list". - 20140311 - COMPLETED - The list will now be DYNAMICALLY displayed. - 20140312 - NEW - Logo. - 20140313 - CHANGED - xth installation + VERSION + MOD. - 20140315 - NEW - Global Search in all FIXED-Drives. - 20140316 - NEW - Icons, all being now same 32x32px. - 20140319 - COMPLETED - Scroll-Routine1. - 20140321 - COMPLETED - Scroll-Routine2. - 20140322 - NEW - Buttons. - 20140324 - COMPLETED - Icons now dynamic, too: ICON-active/inactive. - 20140326 - COMPLETED - The list is now selectable. ProgrammCall works. - 20140327 - COMPLETED - First SH3-Installation read from system. - 20140328 - ADDED - More GFX. - 20140331 - FiXED - MZX works now - was only a stupid typo. - 20140404 - COMPLETED - Procedure Change1L. - 20140405 - ADDED - S3C-Supplements for GWX, LSH and NYGM. - 20140406 - [RELEASE] - Preview@Subsim. - 20140406 - FiXED GWX-recognition (Thanks to Opitz/XVII. Nordfront). - 20140407 - CHANGED - New GWX-Recognition. - 20140409 - COMPLETED - FadeIn and Trailer1. - 20140410 - [RELEASE] [S3F]-TRAiLER@Subsim - 10 days countdown and beginning ishtstorm from the LSH-guys. - 20140411 - NEW - 4GT now dependent of Processor-Architecture. - 20140411 - FiXED- 4GT offered/checked/applied on 32-bit-systems. - 20140411 - NEW - S3F checks your OS whether it is a 32 or a 64 bit system. - 20140411 - CHANGED - S3F consequently now offers to check for and/or apply the 4GT ONLY on 64 bit-systems. - 20140412 - NEW - S3SK now loading en/de. - 20140412 - NEW - S3SK now automatically opens the CORRECT language-file in the selected installation-path. - 20140413 - NEW - Blitz-Routine + lcase + Showdown "Witch-Hunt". - 20140413 - COMPLETED - S3F-recursive-search on all fixed drives 7 times faster. - 20140413 - FiXED- 1b-scrn missing. - 20140414 - NEW - Copy-Routine/32kb in the tests. - 20140415 - FiXED - MOD-Display + "_"-Fix. - 20140416 - NEW - DynList now displayed in Win-COLUMNS. - 20140416 - FiXED - Wrong message coming upon ini-error. - 20140417 - 03 days countdown: i15+i16 bug found. - 20140418 - 02 days countdown: Updated posts 1 and 8. - 20140418 - FiXED- I15+I16 wrong fade. - 20140418 - NEW - language detection (Thanks to Upholder/SteelSharks for testing!). - 20140418 - FiXED - call for H.sie-patch. - 20140418 - FiXED - scan-routine now finds the CORRECT h.sie-patch which has been activated. - 20140418 - FiXED - missing message on existing 4GB-Patch. - 20140418 - FiXED - missing message before S3M-execution. - 20140419 - CHANGED - SS 04.jpg. - 20140419 - NEW - S3M-input-routine now limits input string and checks against default. - 20140420 - [RELEASE] V1.2.5.0b@Subsim - 00 days countdown: NOW IS THE DAY - S3F is now beta! - 20140421 to - 20140521 - 1 month testing-phase and hot-fixes for various minor bugs. - 20140421 - FiXED - Scan-routine finds H.sie-backups (Thanks to Paulebaer/LSH for reporting!). - 20140422 - CHANGED - C:\"-location raises UAC-issues with Win7 and up, now using cwd. - 20140423 - FiXED - outdated message windows showing. - 20140518 - FiXED - no longer displays H.sie-patched versions as "UNKNOWN", but now as "H.sie". - 20140828 - FiXED - Mouse-Pointer-Bug. - 20140828 - FiXED - "Copying"-Bug. - 20140828 - FiXED - S3M-"Forever"-Bug. - 20140828 - COMPLETED - n-reso fix&1024x768 resolution code activated (was there but not used). - 20140829 - NEW - progress-bar for S3M-function included. - 20141028 - FiXED - screen now being refreshed upon return. - 20141119 - NEW - progress-bar for Sizescan. - 20141202 - NEW - now recognizes H.sie-patched-versions as "H.sie" (no longer listed as "unknown"). - 20141218 - NEW - S3H! The whole new AUTOMATED code for H.sie's ingenious Patch-Kit V1.6B1 is included! - 20150121 - FiXED - Fixed H.sie's recognition (4GT now "blanked out" prior to detection). - 20150222 - CHANGED - S3H "append"&"merge" no more applied for NYGM and CCoM (Thanks to Fubar2Niner). - 20150312 - CHANGED - S3H "append"&"merge" no more applied for LSH EDITION 2014/2015/2016 - whatever it will be named. - 20150317 - FiXED - S3H shown as inactive when no installation has H.sie activated (is executable though). - 20150318 - FiXED - SH3.exe opened r/w leads to share violations when running S3C parallely. - 20150318 - FiXED - by mistake the new menu-background showed up. - 20150327 - NEW - PATCH&FiX-Menu. - 20150404 - CHANGED - Message telling that JSGME is not there now mentions the correct version (Thanks to bstanko6). - 20150419 - CHANGED - Subroutines GetSH3Version() and Patch_4GT updated with better code. - 20150419 - FiXED - S3H-patched versions with DEactivated H.sie now recognized correctly. - 20150419 - CHANGED - Progress-Bar#1 is now more suitable on the screen. - 20150422 - ADDED - missing feature in S3M: Change existing FM.dll pointer without having to make a copy. - 20150505 - CHANGED - Reworked the whole GetMOD()-routine for Big-Mod-Recognition. - 20150507 - NEW - Added a progress-counter to the SCAN-routine. - 20150507 - FiXED - minor display-bug in Scan-screen(1b) - reported as "rendered 'fuzzy'". - 20150508 - NEW - The S3H&S3S-Options-Selector now detects H.sie/Stiebler, reads & writes their flags. - 20150508 - REMOVED - HSTOS II does no longer execute the outdated $ff check (Thanks to Stiebler). - 20150508 - ADDED - The Dynamic Menu now also displays the state of the 4GT and FM-entry. - 20150513 - CHANGED - S3F now no longer waits for prog_exec. You can now run tools parallely. - 20150514 - CHANGED - Many new icons completed. New menus underway. - 20150521 - NEW - S3F now checks for running instances. - 20150525 - CHANGED - Scan now ignores .rec and .kop as well. - 20150528 - NEW - V1.7.4.1b - Reads very first SH3-installation from Registry (for backup). - 20150601 - REMOVED - S3F no longer scans for HOS and STOS, instead now uses my own S3H&S3S-Options-Selector-code. - 20150601 - REMOVED - S3F no longer scans for ME1, it now only MD5-verifies the one in the installation-path. - 20150601 - REMOVED - S3F no longer scans for ME2, it now simply writes it from mem to disk and runs it. - 20150604 - NEW - SETTiNGS-Menu. - 20150610 - FiXED - minor bug in size-display. - 20150709 - FiXED - extensive "clicking around" during scan can provoke a crash on 64-bit-systems (NOT on XP). - 20150717 - [RELEASE] V1.7.4.1b (intermediate-version for WAC-tests). - 20150728 - NEW - Added command-line parameters. - 20150812 - CHANGED - It is birthday-time and so I got a wish free: HSTOS II is now called BOS II. - 20150825 - CHANGED - Design1 added. - 20150830 - NEW - S3F has got a new main-menu-picture. Thanks, Canovaro! - 20150902 - CHANGED - Design2 completed. - 201509xx - Harddisk-Crash on DEV-Laptop#2. - 20151024 - Harddisk replaced. System fully functional. Resuming work on upcoming version. - 20151109 - FiXED - Snd-Error found. Fade-Rtn repaired. - 20151117 - [RELEASE] V1.7.4.8b (intermediate-version for WAC-tests). - 20151229 - NEW - MiSSiONS-Menu. - 20160110 - FiXED - minor bug in S3M-copy-part. - 20160211 - NEW - SP2MP-converter code completed. - 20160225 - NEW - S3F now creates a LOG-file in the cwd. - 20160310 - FiXED - minor bug HiRes-WS-display. - 20160323 - NEW - S3F now checks whether you're running as Admin and writes that to the LOG-file. - 20160331 - NEW - S3F now lets you scan ALL or an AREA ONLY. - 20160409 - NEW - S3F has got a new intro now. - 20160420 - FiXED - minor bug in S3M-copy-routine. - 20160424 - CHANGED - SETTiNGS-Menu reworked and new functions added. None. All reported bugs have been fixed. Thanks for your patience. Last edited by BL!TZKR!EG; 11-30-2015 at 04:30 PM. a non-profit fan-production, completely independent of UBiSOFT and unpaid/uncommercial hobby-work just for the fun of it. brand-new and has been developed during the time of 7 weeks (first version, March/April 2014). in beta-status, so there will be bugs. That's normal. under continous development, and we are here to fix'em all. - please LOOK FIRST at page#1 of this thread and check that you DO follow the instructions provided. - please LOOK FIRST whether it really is a serious bug worth the hassle. - please LOOK FIRST whether it has been reported HERE already. - be constructive! Nobody wants to read disruptive/provocative comments. These don't help matters at all. - write down what exactly you have done until the error occured. - try to describe what actually happens. What is working and what does not work. - make a screenshot so we see what you are talking about. We will then see what we can do in order to solve the issue. If everything else fails, we can offer to CHAT ON TS3 and have a TEAMVIEWER-SESSION. Last edited by BL!TZKR!EG; 04-09-2016 at 08:29 AM. Q: "Where the heck is BL!TZKR!EG, where and what is he now at?" A: Status early 2017: I have finally found time for my damn tax declaration and am a bit busy with that. After surviving my visitors from Brazil and you can well imagine what loud and stuff that is, I have programmed a number of tools for WAC and DEF - You see, much is going on in the background. Read the logs because I regularly update this page with news and what I am working on. Apart from that, I am now busy with what you can read in post #11 and have you already seen the new trailer? Always look in post #1 for download-links. Ah yes, and SH3 has had its 10th anniversary and I have released a little fun-demo for that, too. This will take some time... so stay tuned. The new trailer of S3F is just out for you to enjoy. "I'll be back!" Q: "Why does S3F not recognize program x, I DO have it on my harddisc!" A: This happens when you do not have latest version as described in post#2. For instance GWX3.0 Gold comes with an outdated JSGME version which you should update. S3F only recognizes the latest/current versions and ignores everything beyond. Q: "Where can I talk to/meet with BL!TZKR!EG?" 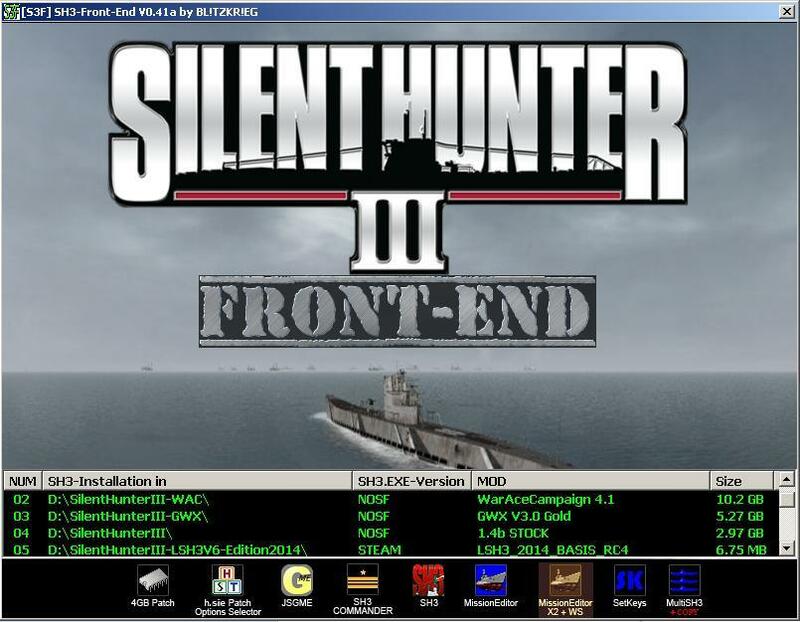 A: You can regularly find me on the Subsim-TS3 and on our Tunngle-Channel "Silent Hunter III". Q: "When is the next version out?" A: The next version (announced V.1.8.7.6b EDiTiON "RAEDER") will be released early 2017. Enjoy its release-trailer & the spring! Last edited by BL!TZKR!EG; 02-08-2017 at 05:35 PM. (*1) This value MUST NOT and UNDER NO CIRCUMSTANCES be zero. (*2) The ZEROth installation is reserved for the very first installation which has NOT been copied (w/ or w/o S3M-function) but has instead been carried out using the original installer (c) Ubisoft. There are reasons to do this. I can explain those upon request. Last edited by BL!TZKR!EG; 08-10-2015 at 06:40 AM.